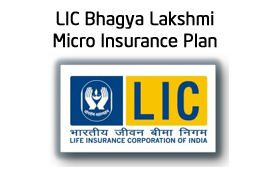 LIC will be soon launching new plan Bhagya Lakshmi Table No 829. This insurance plan will be Micro insurance plan.Micro Insurance is special category made by IRDA to increase coverage of insurance for economic vulnerable section of society. Any life insurance plan with a sum assured of Rs 50,000 or less is called as micro insurance. This policy will be for low-income people & maximum sum assured will be Rs.50, 000. Premium of this policy is likely to be low. Those who cannot afford insurance policy for them this policy will be boon. Let’s take a look at features & benefits of Bhagya Lakshmi micro insurance plan. Mode of premium payment: Yearly, Half yearly, Quarterly, Monthly and SSS. Premium rates of this policy are yet not available. So let us wait to analyze more. Looking at features and benefit it seems to be good policy for low-income group. Those who cannot afford big policies they may opt for this policy, but in absence of premium table it will be difficult to evaluate this policy in detail. As and when I get information about this policy I will update this post. Do share your views on above post. Dear sir i am 30years old and i am looking a suitable future plan for my daughter.so pls suggest me what will be a best option for me?sukanya samriddhi yojna or any other plan.i can invest rs.12000/-per year. As per me Sukanya samriddhi Account is best option for investment for girl child.You can also explore equity for investment.